The above quoted prices include freight to my door. I have to admit that if money were no object, I would have went with the Sawstop. Besides the incredible safety feature that is the hallmark of their design (and their name), it is one VERY well built piece of machinery. It seems that nearly every detail of the Sawstop was carefully thought out, and engineered. The throat plate, the guard-splitter/riving knife quick release, the blade guard, the fence, etc. Everything well made, and from the little in store handling I got to do at my local Rockler store, it appeared like it would be pure pleasure to use. The second choice was the Oliver. Last year I upgraded my jointer to an 8” Oliver, and I was impressed with the quality. The selling points (for me) on the Oliver were a 5HP motor, and a very robust cast iron base. But alas, money does weigh heavily on the decisions I make when it comes to woodworking equipment. This is a hobby for me, not a business. Like most people, I need to balance those costs against the other necessities of life. The Grizzly shopping experience was not without its own frustrations. 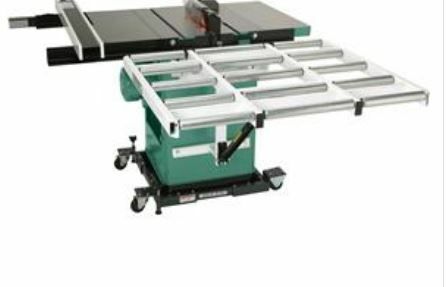 They have two saws that I was interested in, but I wanted them configured a little different than they are offered in their catalog. Those two saws are the above mentioned G1023RL and the G0651. The G1023 was on sale ($125 off), but comes with shorter rails limiting the rip capacity right of the blade to 26”. I wanted a little more than that. So I called them and asked if I could have the 7’ rails (which give a 52” rip capacity) substituted? “NO”. I have to order the saw with the shorter rails and pay extra for the longer rails, plus extra shipping (a total of $278 extra). Then I would have a set of short rails that are worthless to me. I could get the saw with the longer rails only if I ordered the model that includes an extension table and legs. That adds $400 to the price. I don’t need to pay $400 for an extension table. I am a woodworker. I’ll make my own extension table for a fraction of the cost. Similar story for the G0651. Only available with side and rear extension tables, and the total cost is over $2K More than $800 over the G1023’s price. They are marketing the G0651 as a “Heavy Duty” Cabinet Saw, but it was really hard to determine from the catalog what made it any heavier duty than the G1023. For $800 dollars more, I want to see a substantial difference in weight and features. The shipping weight was about 200 lbs more, but I suspect most of that was accounted for in those extension tables that I didn’t want to pay for. Ultimately, I went with the G1023 with the short rails. I figure if I really like the saw, I can add the longer rails later. Are the Sawstop and the Oliver better saws? I suspect they are, but I am not convinced they are THAT much better. The Grizzly was less than half the cost of either of the other two saws. Less than HALF!!! The Oliver and the Grizzly are both made in Taiwan. The Sawstop is made in the US. I read all the reviews I could find on the G1023, and watched all the Youtube video I could as well. By all accounts it seemed like a pretty darned nice piece of equipment. It had all the features I NEEDED, and wasn’t gonna break the bank. Took delivery of the Grizzly G1023 yesterday. Spent the evening getting it into my basement shop, and began the setup. As I write this I still have a lot to do. I managed last night, with some help, to get it down the stairs; get the cosmoline cleaned off the table; get the wings and the fence rails attached. I squared the table to the blade (within .001). Plugged it in and gave it a test. I was concerned the 3hp motor would draw too many amps for my 15 amp circuit, but it fired right up and ran fine. I haven’t cut a single piece of wood with yet, but I wanted to give some first impressions. I must admit that I was concerned that, at this price point, I would be sacrificing too much in the way of quality, compared to the other two saws mentioned above. I entered into this deal for the Grizzly with some trepidation. There is no local showroom where I could go and see the saw before purchasing. That always makes me nervous. All that being said, I have to say I have been pleasantly surprised. The quality is very good. When I started it for the first time, I was amazed at how smooth and quiet it ran. The hand wheels that control blade height and tilt angle are heavy cast iron and operate smoothly. It sits about an inch lower than my old saw, and there are no feet on the cabinet to adjust for height or level. 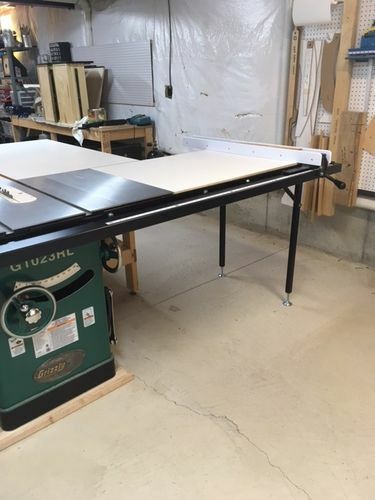 My basement floor is a little uneven and I have a little rocking going on, so my next task is to raise it up a little to match the height of my outfeed table, and then shim it level and eliminate the rock. I also have to get the dust collection hooked up, and set up the fence. So far, I am convinced I made a good choice, and the upgrade to this saw is a huge improvement over my old one. Subtracting what I got for my old saw on Craigslist, this upgrade cost me a little more than $800. WELL worth it. I’ll come back and give ya’ll an update after I’ve had some time to run her thru her paces, and put a few hundred board feet of lumber through it. I will also add some real photos. Thanks for the information. You have saved me a lot of leg work! I’m just about at the same place you were before buying your saw. I will have a new saw before spring and this will help with the decision! Congrats! Thanks for the excellent run-down on your decision-making process. I bought the Grizzly 1023 about 12 years ago. Very good saw. Same problem with the rails. I’ve used Powermatic and Delta so I had something to compare to. A couple of things I’ve noticed. I had to replace the arbor bearings within a year, also had to replace the arbor blade flange. It’s stamped steel instead of forged so it would deform when it was tightened. I replaced it with a powermatic flange and nut for about $25. The saw has been trouble free since those repairs. The saw is very accurate and vibration free. Good choice for me. I bought this saw back around 1985. I had to replace the arbor bearing very quickly. I used this saw a whole lot and I used it for all it was worth. We would use it at full depth resawing Beech lumber from barn beams to make spiral stair case railings. I did everything on it that could be done. I even used it to make custom cove hard wood trim. if you keep a sharp blade in it it will do every thing that you need it to. Been 30 years and it is still going strong. A couple more observations to note. The riving knife and spreader are pretty high quality parts. A couple of complaints though. First is that it is extremely difficult to adjust the alignment with the blade. The adjustment screws cannot be accessed from above the table, and from below the table it is impossible to see what kind of effect you are having on the alignment when you make an adjustment to one of the allen head screws. A lot of trial and error, but I finally got it right. Now that it is adjusted, I don’t expect to have to mess with it much ever again. The second complaint I have is for the spreader that replaces the riving knife for use with the guard. You should be able to pull out the throat plate, reach in and flip up the cam lever that holds the riving knife in place, and then replace it with the spreader. You can actually do that, however, the standard throat plate cannot be reinserted after the spreader is installed (because of the width of the device with the anti-kickback pawls). It requires you to reinsert the throat plate before you install the spreader, and then you have to go underneath the table to re-engage the cam lever and lock the spreader in place. A total PITA. Enough of the bad news. Let me talk about the good stuff. I am still amazed every time I run the saw at how quiet and vibration free it is. The quality of the cuts is superior in every way to my old saw, using the same blades. I also love the smooth action of the handwheels. They are bigger, and heavier than the ones on my old Jet, and the knob that locks the handwheel in place is a beefy heavy steel also, unlike the plastic on the Jet. The table wings went together easily, and when I checked for flatness across the seams with my Veritas straightedge, they were as near to perfectly flat as possible. There is no space or light visible under the straightedge anywhere along its length. No shimming was required. So far the dust collection (below the table) seems to be functioning great. Above the table, I think I will need come up with some kind of solution. The dust above the table isn’t terrible, but It should be addressed somehow. I am glad that you are happy guy. I have loved mine forever. Real photos added as promised. As you can see, I need to address the extension table to the right of the blade. I am reluctant to put any time or money into this until I decide if I am going to purchase the longer rails. So far I have made a “thin stock ripping jig”, a zero clearance insert, and a crosscut sled for her. I’ve owned this saw for about 6 years now. Love it! Dust collection only so-so, and the supplied arbor wrenches are junk. But otherwise a very fine saw. I looked at those other options too. But, at less than half the cost, the Grizzly was a no-brainer. If your gonna upgrade to longer rails, just get a whole new fence system. I have an Incra TS-LS system on my saw and it is SOOO worth the money. I absolutely love the precision the fence gives you. There is no way someone could pay me to go back to the biesmeyer style. Its $500 bucks, but that includes shipping. If it’s your first order with them you can usually get a 10% discount. And they seem to go on sale a couple times a year. I absolutely love mine! Buying the rails separately only saved me a little over $100. However, if you order the saw with the longer rails, they include the extension table to go between the rails, but they don’t give you the cast iron wing that goes on the right side of the table. I wanted the extra weight the second cast iron wing provides. So, this was another good reason to add the rails after the fact.